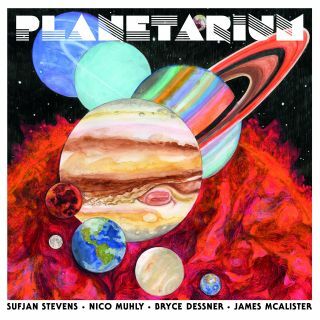 Cover for new record from Sufjan Stevens, Bryce Dessner, Nico Muhly and James McAlister. Earth's solar system has influenced countless artists through the ages, but very few have produced an entire album literally dedicated to it. That's what you'll find with the new record "Planetarium," from collaborators Sufjan Stevens, Bryce Dessner (from the band The National), composer Nico Muhly and James McAlister, who frequently collaborated with Stevens. Past records have used the solar system and other objects in the universe as inspiration, but most have been instrumental — you can listen to the catalog of John Serrie for an example. The difference with "Planetarium" is the addition of exploration-defining lyrics to go with the music. Space.com spoke with Muhly, McAlister and Stevens in an email interview about the song- writing process and their inspiration for the album. Space.com: Listening to the album I can't help but think about how passionate you must be about the workings of the universe. Let us know a little bit about how your enthusiasm for space evolved and what led you to make this record. Nico Muhly: I actually fear outer space. The idea of infinity terrifies me — this project was a great way to explore the actual vastness of it (cf Mars) and then closer, more detailed things like the surface of the moon, of which a daguerreotype was made in 1840, if I remember correctly. It's about surface, detail, enormity and infiniteness. Looking back on the project, I also see now that the sonic environment has a lot to do with educational videos about space. We all grew up in the 80's, more or less, and those NOVA videos always had a really specific atmosphere, which I feel like we must have inadvertently channeled in this project. Space.com: The mixture of sounds on the record is very cosmic, and I can certainly see it as a soundtrack for the stars. How did that come to be, and who are some of your influences, musically and otherwise? James McAlister: The project started first as acoustic music. It was written for guitar, piano, celesta, trombones and strings. We then experimented with augmenting these already sonically dense arrangements with sounds from the electronic palette. This worked well — and I think the idea was to makes something somewhat ageless and neither overtly acoustic or electronic. For me, Brian Eno has always been an influence especially in the idea of creating sounds. The early electronic pioneers Kraftwerk and Tangerine Dream are key as well, and Ali Farka Touré really resonates with me on a soul level. Space.com: It must have taken a bit of research to come up with and personify each planet through lyrics. Plus, weaving them into melody seems like an incredible task from the outside. Can you tell us a bit about process of writing the record's lyrics? None of the concepts on this record are new: Everything is taken from other texts, from other sources. I'm just re-framing everything from a liberal arts/Waldorf School/Christian perspective. Humans have been projecting all kinds of psychological and emotional characteristics on the objects in space since the moment they laid eyes on them. Hence astronomy, astrology and mythology. We equate loneliness and abandonment with Pluto and attribute "fierceness" with Jupiter, simply based on size and proximity. In this way we are boundless story-tellers seeking to deduce meaning and myth from utterly inanimate objects. (There is absolutely no life on Mars, but this doesn't keep us from imagining it.) This says more about human nature than about outer space, of course. The world around us reflects all the complicated dimensions of human experience: in the landscape of our planet, and in the dreamscape of the universe, we perceive warfare, desire, love, rebellion, envy, exhilaration, and beauty. There is no limit to human experience, emotion, and imagination. I believe we contain more creative potential than the entire known universe combined. We are abundant in life! This interview was lightly edited for clarity. "Planetarium" is available on Amazon. The group will be performing live in Paris; Brooklyn, New York; Los Angeles and Oakland, California, in July 2017. Learn more about the album and collaborators through their website. Follow Steve Spaleta @stevespaleta. Follow us @Spacedotcom, Facebook and Google+. Original article on Space.com.